The Soviet and Russian directors spearheading these flicks certainly didn’t hold back in terms of scale - thousands of extras were used during years of filming to create some of world cinema’s most iconic war films. One of the gems of world cinema, Alexander Nevsky by Sergei Eisenstein recalls the historical victory of Russian Prince Alexander Nevsky over the German knights of the Teutonic Order in the Battle on the Ice in 1242. This grandiose four-part film adaptation of Leo Tolstoy’s novel depicts battles from the Napoleonic Wars including Austerlitz and Borodino. Set during the Russo-Turkish War (1877-1878) the movie follows detective Erast Fandorin, who is tasked with ousting an Ottoman spy embedded in the Russian army. The fate of the whole war rests on his shoulders. This iconic Soviet movie recounts the lives of two friends who experience various conflicts over 40 years. These include the Russian and Spanish civil wars, the Great Patriotic War, and the Second Sino-Japanese War. It’s believed that Officers inspired countless young Soviet men to devote their life to the Army. The joint Russian-Belarusian movie tells the story of the first Soviet stronghold to face the German invasion, while portraying the tragedy and heroism of the Soviet soldiers.The Red Army fought tooth and nail to defend Brest Fortress in a desperate bid to prevent the Nazis from advancing. This war drama follows the lives of several Soviet soldiers from a depleted infantry regiment forced to retreat to Stalingrad during the summer of 1942 - one of the hardest periods of the Great Patriotic War. In 1942 in Karelia, behind the front lines two anti-aircraft platoons are deployed. Suddenly, a huge unit of German paratroopers appears in the forest. Only AA gunners can stop them. The problem is that they’re all women. The movie depicts large-scale Soviet army drills, between opponents designated as the “Northern” and “Southern” army groups. The latter’s commander designated three reconnaissance to be dropped behind enemy (Northern) lines - but chaos ensues. The movie was followed by a sequel called Hit Back (1981), in which the protagonist paratroopers are joined by Soviet Marines. 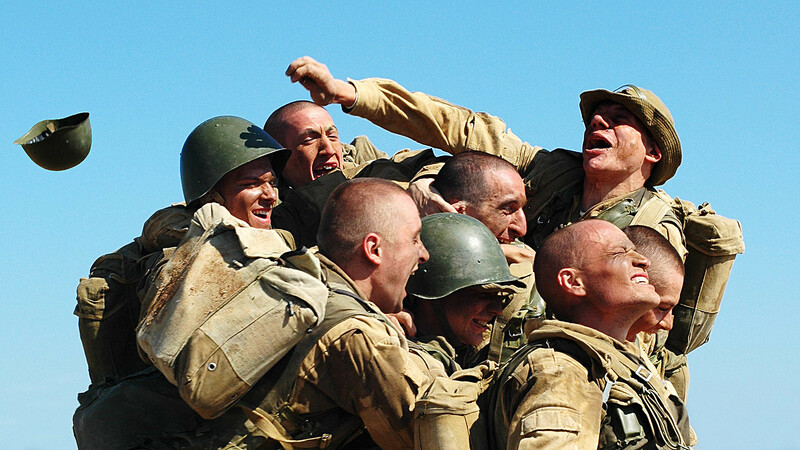 One of the best war movies in post-Soviet Russian cinema, The 9th Company is devoted to the Soviet war in Afghanistan. Despite deviating from reality, the movie perfectly depicts daily life of Soviet soldiers in the Afghanistan shortly before the Soviet Union left the country.